Another advantage of our Factory in Maleme Street is that we are able to produce custom fencing with a point of difference, giving you the opportunity to customize & individualise the look of your property. Click through to see some examples of corrugated fencing solutions for our customers. Boundary and privacy fences are among the most visible features of many homes. That’s why the fence you select needs to be strong, durable, and attractive – it should add value to your home. ColourPanel colour steel fencing is exactly the same on both sides which means both you and your neighbours see the good side of the fence. These modular panels require no painting and minimal maintenance. Options for this fence include matching gates, lattice-top panels, colour matching and mixed colouring. EliteWall Designer Fencings superior acoustic performance makes it is a popular option for rest homes, motels, or properties beside a busy road. Options for this fence include negative detail joints, gates, steel panels, aluminium slats or louvers, lighting and letterboxes. Made to match in with our traditional farm style gates, Post and Rail Fencing is great for rural properties where privacy is not an issue but you really just want to define the area or property boundary. ADF can build them with 1, 2 or 3 different rail options to suit the look you are after. We can come up with a custom entry way and package to suit your site. 2-Rail Signature in Radiata - Post&Rail can also look effective in residential situations. This lifestyle block entranceway is simply angled to define the gateway clearly. GreenScreen provides the complete package of components assembled specifically for your project, using premium quality materials sourced from leading manufacturers. With its unique gridded mesh fence panel that has been designed to support climbers and plants. It provides initial security and a barrier while the unique integrated mesh design encourages growth and provides maximum support and protection for the most delicate climbers. Options for this fence include a black colour finish, with specialised fittings to offer a quick and strong assembly. EuroMesh is designed as an unobtrusive and cost-effective perimeter fence which also offers a high level of security. EuroMesh is manufactured to strict quality standards and formed with longitudinal folds at height intervals for added strength and rigidity. A proven performer that is used all over the world. Anti-climb spikes on the top of each panel will deter intruders, or the panel can be reversed and installed upside down to give a smooth top which is ideal for child care centres. Options for this fence include pedestrian and vehicle gates and child-proof safety locks. child-proof safety locks and custom colour matching. Premium aluminium panel security fencing for protection of your property. With an impressive appearance, strong uprights, and three supporting rails, SentryPanel fencing makes an impenetrable barrier for superior protection of your investment. Constructed from heavy-gauge aluminium and powdercoated for long-life, SentryPanel is available in a black finish as standard or can be powder-coated to a custom colour of your choice. Options for this fence include swinging, sliding and pedestrian gates, steel fabrication options and colour matching. SentryPanel Spear-Top - Enhance your business premises while keeping it secure. long-term durability, even in areas near the sea. Options for this fence include matching gates, pool safety locks and custom powder-coated colour matching. Glass Fencing complies with all pool fencing safety standards, and allows a clear view to and from the pool area. It is unobtrusive, giving a spacious open feeling to your pool or outdoor living area. Maintenance is simple, which means you have a great-looking solution all year round. The Glass Fencing panels can also be incorporated into the EliteWall system as an added feature. A great option for properties beside a busy road. Ideal for motels, rest homes, and hospitals to reduce noise levels from outside. Also ideal for reducing sound pollution from commercial sites in residential areas. The patented solid Poly-Fibre Cement composite sandwich panels are designed to deflect noise and the acoustic performance of this product was evaluated by the Acoustics Research Group at the Australian National Acoustic Laboratories. What is the surrounding climate? Different types of material react differently depending on the climate of the area. Wood swells and shrinks depending on the weather, types of metal can rust more easily than others. You want the type of fence that is durable to your climate and weather and temperature. 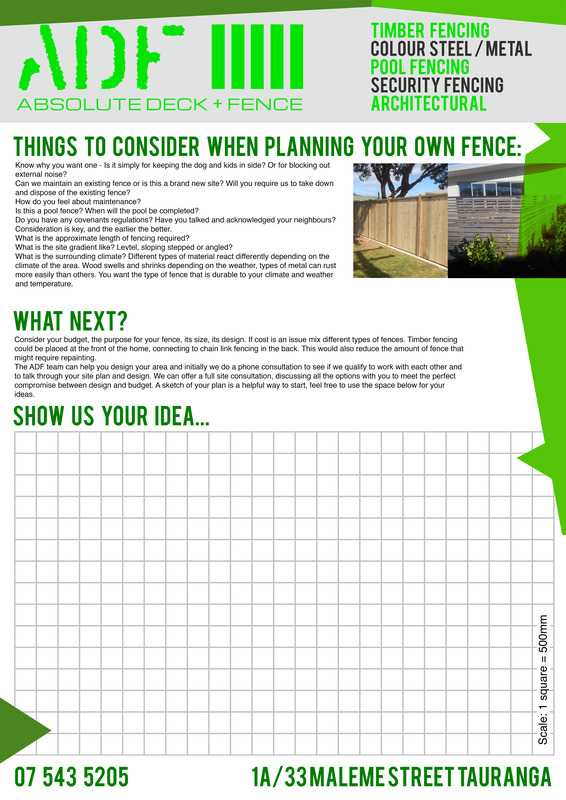 Consider your budget, the purpose for your fence, its size, its design. If cost is an issue mix different types of fences. Timber fencing could be placed at the front of the home, connecting to chain link fencing in the back. This would also reduce the amount of fence that might require repainting. All our aluminium and timber gates and fences are manufactured in our Tauranga factory which means faster turn around times and more design flexibilty for our clients. All ADF fences and gates include the highest quality of componentry such as locks, hinges and latches. Wooden Pailing Fences are the most common fence seen on property boundaries around New Zealand. At ADF we have worked with numerous clients to provide a bespoke solution for each property. fencing solutions, we expertly repair and alter existing fencing as well. ADF prides itself in working with you from the initial plans right through to completion, we are with you every step of the way. We make sure the outcome fits your plans and budget, and we deliver a result you can be proud of for many years to come. When you need a fence – we have the solution. Whether it's post and rail fencing for your lifestyle block, timber fencing or a coloured steel fence for your home, or pool fencing to keep your children safe – we have what you need. Know why you want one - Is it simply for keeping the dog and kids in side? Or for blocking out external noise? Can we maintain an existing fence or is this a brand new site? Will you require us to take down and dispose of the existing fence? Is this a pool fence? When will the pool be completed? Do you have any covenants regulations? Have you talked and acknowledged your neighbours? Consideration is key, and the earlier the better. What is the approximate length of fencing required? What is the site gradient like? Level, sloping stepped or angled? Slat fencing features long clean lines that direct your eye to the landscape beyond. Custom made to the size you require, the slats can be mounted horizontally or vertically, and the gaps between can be increased or reduced to your liking. At ADF we have worked with numerous clients to come up with large and small scale slat fencing solutions for home security and privacy. Timber Picket Fences are an unobtrusive way to fence your boundary line. The square top option is clean and simplistic. Picket fencing is usually built between 90 to 125cm tall and can be as long as you need. These can be left as natural timber, or can be stained or painted. We can also build matching pedestrian gates to suit. At ADF we have worked with numerous clients to provide a bespoke solution for each property. Simply put, Cedar fencing is highly durable and lasts a lot longer than most other types of wood fences. It contains natural oils that help make the wood resistant to decay and insect attacks, increasing its durability and strength without the use of chemical treatments. Cedar is highly stable, meaning your fence will stay straight and sturdy for the long haul. Wooden Acoustic Fences are more than just a simple timber fence. These are specifically designed to reduce noise significantly with low visual impact. These are a great solution for for minimising pollution from busy roads and in built up urban environments that can be a growing problem in our densely populated modern world. These can also help to reduce noise while maintaining an unobtrusive style of fence. We give you the option to choose between our certified Boundaryline products or have your gate custom made in our local Tauranga factory. We have gates available in a range of colours and styles for both residential and commercial applications.